Our gift certificates make the perfect holiday gift for wine enthusiasts and professionals! Attend wine and fine spirits course (includes wine/spirits tastings, educational material, and a gourmet lunch) at any of our 9 locations across the U.S. 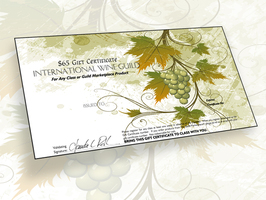 Contact the Guild directly at 303.296.3966 or info@internationalwineguild.com for a gift certificate denomination not listed below. You will be able to print a receipt at the time of purchase. Please allow 24-48 hours for your gift certificate to arrive via email. Gift certificates are valid for one full year from the date of purchase. Named one of the top five wine schools in the nation by Food & Wine Magazine, we offer wine and spirits classes for professionals and enthusiasts across seven states. The International Wine & Spirits Guild (IWSG) has trained more than 3,800 students since its inception in 1997 in Denver, Colorado. We have trained chefs, sommeliers, wine and fine spirits merchants, wine judges, and more across Colorado - including Keystone Resort’s wait staff - and the nation. Many of our students have launched successful wine businesses, including Bonaquisti Wine Company, Equipment de Vin, and Vinovium Partners. Whether your goal is to launch or grow your hospitality career or simply delve further into your wine or fine spirits passion, we offer more than 24 courses to satisfy learning and certification needs. With a strong commitment to community and quality, we are proud of our partnerships with local wine businesses and our farm-to-table culinary approach.